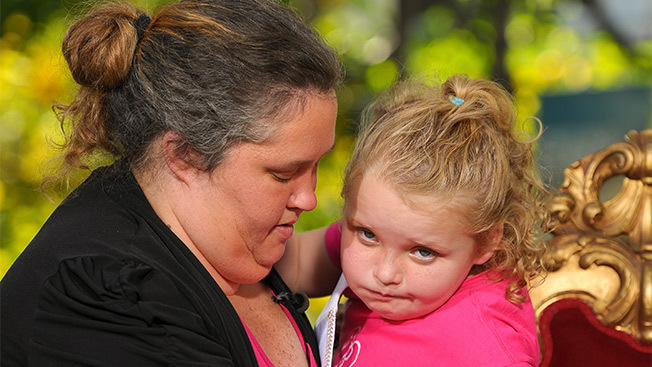 Here Comes Honey Boo Boo is going off the air for an appalling reason. The hit TLC reality show about the misadventures of an Arkansas family has been canceled in the wake of reports that "Mama" June Thompson got back together with former boyfriend Mark McDaniel, who was convicted in 2004 of forcing himself on an 8-year-old child. McDaniel and Thompson were also dating when he committed the crime, according to reports. "TLC has canceled the series Here Comes Honey Boo Boo and ended all activities around the series, effective immediately," reads the unbylined statement submitted by a network spokesperson. "Supporting the health and welfare of these remarkable children is our only priority. TLC is faithfully committed to the children's ongoing comfort and well-being." It's a sad end to a show that was always a little sad and inspired reams of cultural criticism discussing not just whether the show's mere existence constituted exploitation of a poor family, but life in the South and poverty in general. The star of the show was supposedly Alana Thompson, Honey Boo Boo from TLC's beauty pageant reality series Toddlers and Tiaras, but Mama June quickly became the focus, as the series focused its gaze on her struggle to navigate motherhood of Alana and her three other daughters, Lauryn, Jessica and Anna. Thompson has denied seeing McDaniel, but TMZ has posted recent photos of the pair together. A fifth season of Here Comes Honey Boo Boo had reportedly been shot; it joins reruns of 7th Heaven among family-friendly shows rendered unwatchable for some by the poor decisions of the cast.